One of my favourite ways to cook is to mix up different sauces in a bowl/jar, and use it as a cooking sauce. Not only is it a fast, easy and lazy way to cook, most of my concoctions have turned out to be so tasty I've kept them on as kitchen staples. 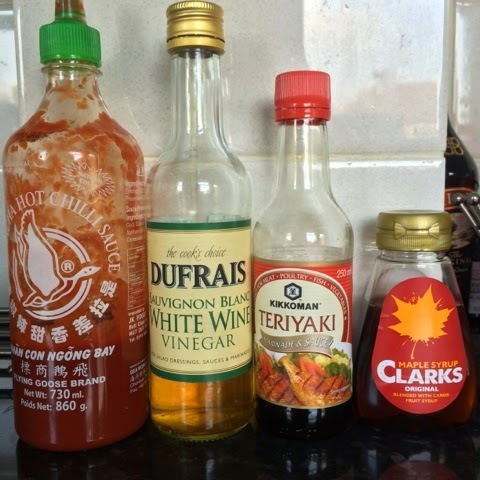 Whilst staying over at my friend's place, I cooked lunch for all of us and found these condiments in the cupboards to make a marinade for some salmon fillets. I can't describe just how good the savoury and sweet teriyaki with tangy vinegar, and spicy sriracha tasted. The maple syrup also rounded off the marinade perfectly. This is a 15 min dish that brings full on flavour. We had it with boiled potatoes and salad with coleslaw. 5. Serve with your choice of carbs and veg. It went very well with potatoes, and rice will be another good option too. If you don't happen to have the teriyaki sauce, you can use soya sauce instead and up the maple syrup by another 1/2 -1 tsp depending on how sweet you like it. You can also substitute the maple syrup for honey or regular sugar. 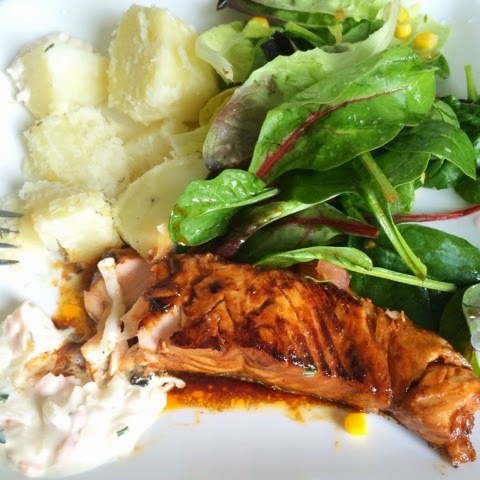 Here are more of my recipes on fast meals.